We create bridges to ‘bridge’ gaps between teeth when one or more teeth are missing. A gap between teeth can cause problems resulting in chipped or broken teeth, uneven chewing, changes to your appearance and can increase your risk of periodontal disease and cavities. There are two types of bridges: removable and fixed. A removable bridge is custom made to fill the gap between the teeth in your mouth. A removable bridge can be made without wires and is designed with a surface that looks like a gum, with a partial denture or tooth attached to it. A fixed bridge is generally made of porcelain, or porcelain fused to metal crowns, and attached to other teeth or implants in your mouth. Our boutique NYC staff of dentists has many years of experience successfully treating all sorts of situations. We accept many types of dentists insurance. Hunters Point Dental Services offices are near Midtown NYC – only one stop away from Grand Central Station in Long Island City Queens. Call us at 718.392.4982 for an appointment, or schedule a dentists appointment online, to see what we can do for you. 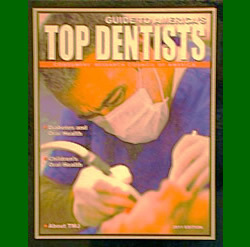 Hunters Point Dental Services has been serving the dentistry needs of Astoria, LIC, Sunnyside & Woodside in Queens, Midtown in Manhattan and Greenpoint in Brooklyn since the 1970′s. 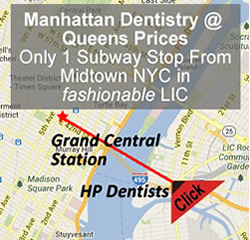 We offer Manhattan Dentistry At Queens Prices. This entry was posted in Bridges on July 2, 2013 by Spiderman009.